Ideally located for theatre-goers, Rosewood London is the most luxurious hotel in the West End area. The grand Grade II listed building houses 262 rooms and 44 suites, two restaurants, an opulent bar and the exclusive Sense Spa. The most luxurious hotel in the West End district. Located in High Holborn, Rosewood London is the most luxurious hotel in the area and is nearby to the British Museum, Covent Garden and the vast number of shopping hotspots and attractions within it including the Royal Opera House and the West End theatres. The 1914 Grade II listed building has been lovingly restored and now houses 262 rooms and 44 suites, all boasting amenities such as LED televisions, Geneva sound system, Czech & Speake toiletries and fine Italian bedding. Dining options include all-day brasserie Holborn Dining Room and Scarfes Bar. One of two restaurants at the hotel, the Mirror Room offers fine dining in a relaxed space. Described as "the social hub of Rosewood London", the Mirror Room is one of two restaurants in the new hotel and is the fine dining option out of the two - the other is all-day brasserie the Holborn Dining Room, which serves classic British dishes and high tea. Situated next to the hotel's lobby, the Mirror Room is a long, narrow space lined with mirrors on the walls and ceiling. The low tables are laid with Limoges china and sparkling crystal, and the sofas create a more relaxed dining experience. Diners can choose between a selection of small plates to be eaten tapas style or a range of large plates, all of which are made from seasonal and freshly sourced ingredients. During the afternoon the restaurant served afternoon tea, with a selection of sandwiches and loose leaf teas accompanied by classic cakes. Top quality British food is served at this Martin Brudnizki-designed brasserie. 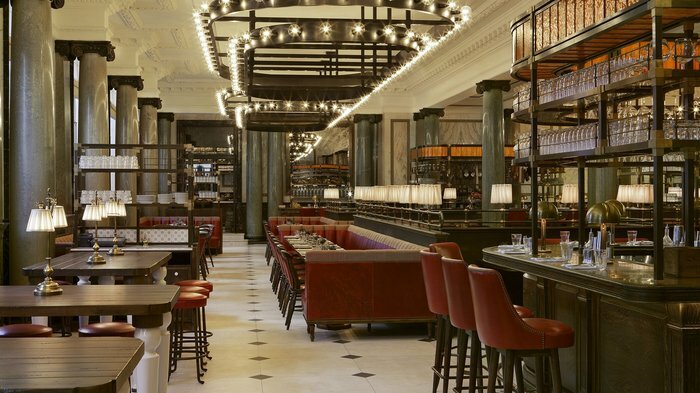 The launch of the luxury Rosewood London on High Holborn was one of the new hotel highlights of 2013, and the hotel's in-house restaurant, the Martin Brudnizki-designed Holborn Dining Room, welcomes its first diners in February 2014. Rosewood is renowned for designing its hotels according to location and the Holborn Dining Room's nod to Britain comes in the form of mini milk bottles as vases and custard vessels, banquettes made to look like park benches, and seat covers in London bus red. The menu, overseen by Executive Chef Lee Bull, includes traditional British dishes such as lamb chops, corned beef hash and hock & coq pudding, all made from the finest locally sourced ingredients. And with former Ivy Head Chef Des McDonald, whose first restaurant was The Fish & Chip Shop in Islington, at the realm, the fish and chips served with mushy peas is one of the obvious menu highlights. High tea is also available, with a selection of sandwiches, Welsh rarebit, cream tea and a daily changing cake menu. Sup on cocktails while lounging next to the log fire in this cosy bar. Named after the cartoonist Gerald Scarfe (whose characterful illustrations adorn the bar's walls), Scarfes Bar is a shining beacon in the otherwise lacking High Holborn area. Part of the new, luxurious Rosewood London hotel, the bar is grand and stately while also being welcoming and homely. Designed by Martin Brudnizki, it has a roaring log fire, cosy velvet armchairs and bookcases stacked with antique books hand-picked by a Portobello antique dealer. At lunchtime diners can choose among a variety of cuisines, with Indian curries, European style casseroles and homemade pizzas on the menu. In the evenings, meanwhile, there's a range of bar snacks and lighter dishes such as veal and mushroom meatballs, fried lobster momo's and Bengali vegetable chops. Guests are also spoilt for choice when it comes to drinks, with the bartenders on hand to advise on beer, match wines or create one of the tempting cocktails. With its own entrance off High Holborn, the bar is open to the public as well as hotel guests. Home to London's most exclusive double treatment rooms. From cheap budget accommodation to luxury 5 star hotels see our discounts for hotels, including Radisson Blu Edwardian Sussex Hotel from 49% off.